How to Make Soothing Cucumber Eye Gel ? What to do when you wake up with some puffiness in the eyes? How to fix the puffy eyes instantly? Worried a lot about your dark circles? Here is a one-stop solution! Eyes are the epitome of the face! You may have radiant unblemished skin. Yet, when you are exhausted or sleep deprived, your eyes show it all! Dull eyes, puffy or baggy eyes, dark circles, etc affect the way you look. Excessive heat, sun exposure, exposure to excessive light, sitting for longer hours before computers etc affect the eyes. 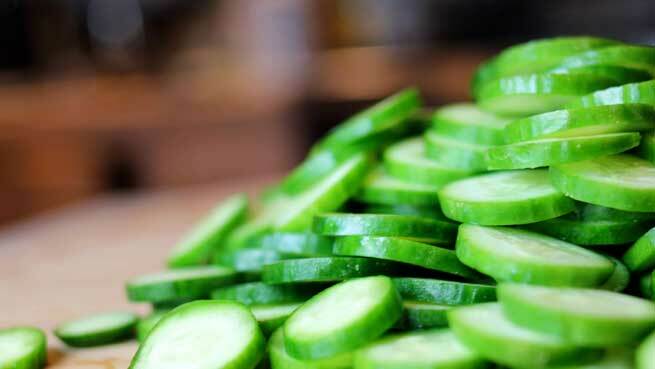 If you are looking for a quick remedy to soothe your tired eyes, you may just need a few pieces of cucumber. You may easily get a pack of cucumber eye gel or eye cream from the nearby store. However, your kitchen is much closer to any shop. 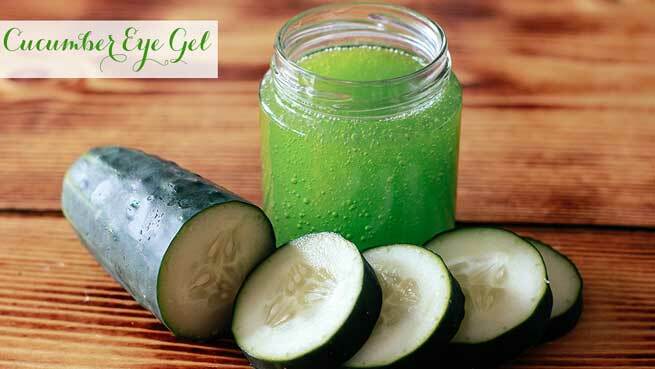 Grab few cucumbers; make your own soothing cucumber eye gel! Cucumber, one of the water vegetables, is a refreshing summer retreat. You can reap loads of benefits with cucumber. The wonder veggie can be taken orally and topically! 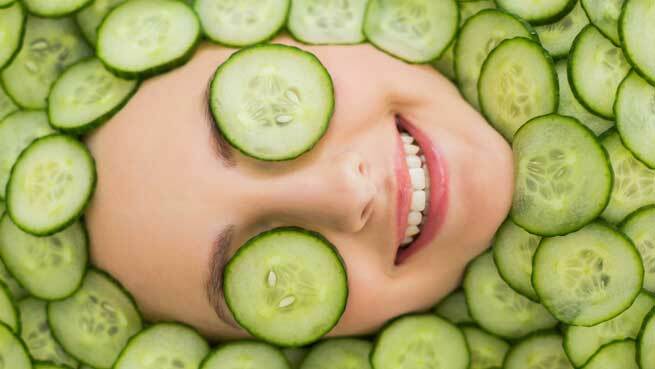 Remember the good old days where slices of cucumbers are placed on the eyes to get rid of the tiredness? Loaded with richness of Vitamin B and cooling properties cucumber is a best remedy for many ailments. Do you have cucumber? Do you know how to blend? You are done. Slice the cucumbers or cut it into small pieces. Don’t peel the cucumber skin. One medium sized cucumber is sufficient to make the plain cucumber eye gel. If the skin of cucumber is thick, you may slice the cucumber into thin round slices for easy blending. Just blend the cucumber pieces in the blender or juicer until it coagulates like jelly, a thick gluey substance. Your soothing cucumber eye gel is ready to use! Just apply the gel around the eyes. It is all natural remedy with no artificial ingredients. You can store this gel in refrigerator. This is the simple method to make soothing cucumber eye gel. You can add a few more natural healing ingredients to make different types of cucumber eye gel. Why Cucumber Gel for Eyes? Cucumber gel is made with natural ingredients with very minimal efforts. It costs you less than Rs. 50 but provides benefits that are priceless. Cucumber eye gel is suitable for all skin types. The base method of preparing cucumber eye gel remains the same. You may need to add some additional ingredients to the blender. Aloe vera is yet another wonder gifted to us by Mother Nature. The gel has cooling properties similar to cucumber and amazing anti-inflammatory properties. Besides, it is also combats against free radicals. Make the cucumber gel and add freshly squeezed out aloe vera gel to the cucumber eye gel. Alternatively, you can blend both cucumber and aloe vera gel together. Just add honey to the gel mix of cucumber and aloe vera. Honey is soothing agent and reduces the irritation. Choose organic green tea. Prepare green tea. Add the green tea mix when you blend the ingredients used to make cucumber eye gel. Apply the gel before you go to bed. Use it regularly to bring a miraculous improvement in treating the dark circles. Besides, the overall eye health is toned by cucumber eye gel. Eye fatigue is quite a serious concern, but it is very rare. Intense use of eyes gradually reduces the vision health. You can use the cucumber eye gel to improve the overall health of the eyes. It is the best preventive medicine for eye fatigue. It is a great natural remedy for sensitive skin. People with sensitive skin are prone to develop many skin conditions. They have to be very cautious in choosing and using the cosmetics. This is a safest and side-effects free remedy for sensitive skin to treasure.